For many thousands of years people have been using herbs to treat a variety of ailments. Though pharmaceutical drugs are more commonly used today than herbs, there are many people who feel that products straight from the earth are effective for many things, and are much less dangerous than chemical drugs. We believe that people have the right to access what our earth naturally provides, and we strive to provide a wide variety of the highest quality herbs and herbal tinctures. Strict FDA regulations prevent any herb from being sold as a treatment or prevention of an ailment and as such we cannot say specifically what any herb can do for you. However, we highly recommend doing your own research as there is much information to be found online and there are many herbal remedies to common ailments! We take pride in what we do. All of our products are guaranteed to be made to exacting standards and your complete satisfaction is always assured! 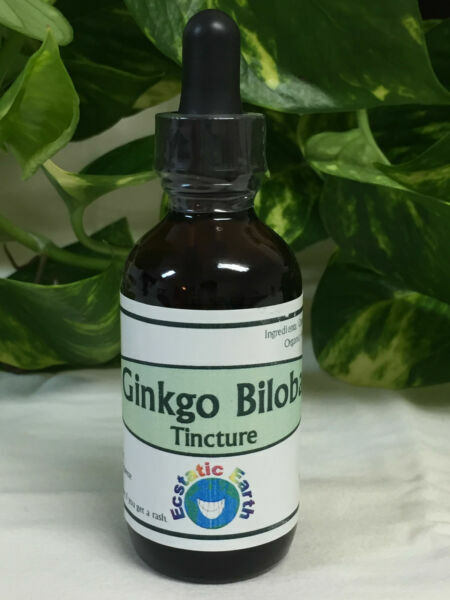 Our organic tinctures are cold-brewed to ensure the full extraction of constituents from each herb. Herbs are tinctured with 40% alcohol by volume (certified organic food grade alcohol). They are allowed to cure for 6 full weeks to ensure maximum strength. Each tincture comes in a light-resistant amber bottle with an eye dropper and a tamper-evident seal. Here at Ecstatic Earth, we have a 100% customer satisfaction guarantee and are always available to help with questions! We ship Mondays through Friday via USPS First Class Mail with a delivery confirmation number. You will receive an email from eBay on the date of shipment with your package's tracking information so that you can track your package from our door to yours! Sales tax is only applicable to purchases made in Maine. Your product will come with the statement : This statement has not been evaluated by the Food and Drug Administration. This product is not intended to diagnose, treat, cure, or prevent any disease. It is up to you to research, discuss with your health care provider, and/or listen to your body - ALL herbs affect people differently - before taking any new supplement or herbal remedy it is advised you speak with your doctor or natureopath. Visit Our eBay Store for Other Great Organic Products!